Visa, aka Omar Visa, is a 7 year old black male born November 10, 2009. His sire is Yahoo Omar and his dam is Aunt Mary Jane. 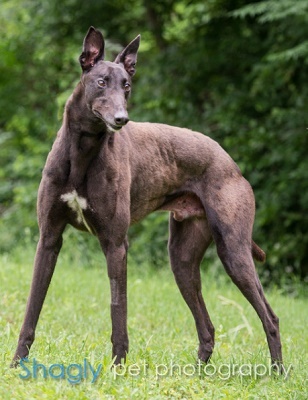 Visa had a short racing career at Gulf Greyhound Park of 14 races according to Greyhound-data.com. He then went on to sire puppies, with one currently registered litter from May 2014. Visa will charge happily into a forever home. Visa is not considered cat tolerant at this time. Visa is a lover, not a racer. After just 14 races, Visa was sent onward to sire puppies. 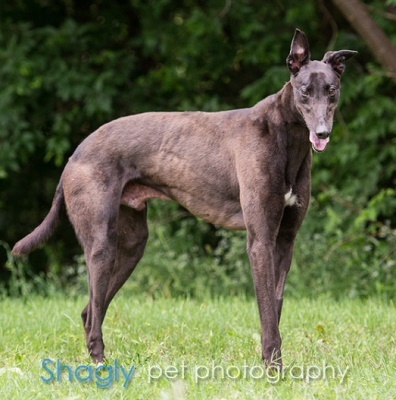 In his foster home, he continues to show his softer side, sticking close to his people for hugs and attention and preferring a brisk trot around the block to racing around the yard. He sleeps in an open crate outside his foster parents’ bedroom at night but stays free near his people the rest of the time. He’s comfortable and capable with stairs. Visa is still learning about toys but shows early signs of becoming a collector. He enjoys getting out of the big basket and moving them to his mat. Visa lives on friendly terms with a beagle and a parakeet. He gets a little jealous when other pets get what he feels is too much attention, and he seems well suited to be an only dog. He stays alone with free rein of the house for four to five hours at a time with no potty accidents or destructiveness, and he’s happier to go on a short, brisk leash walk than to be turned out into the back yard. He would do fine in a home without a yard or without a big yard, as long as he gets regular walks.